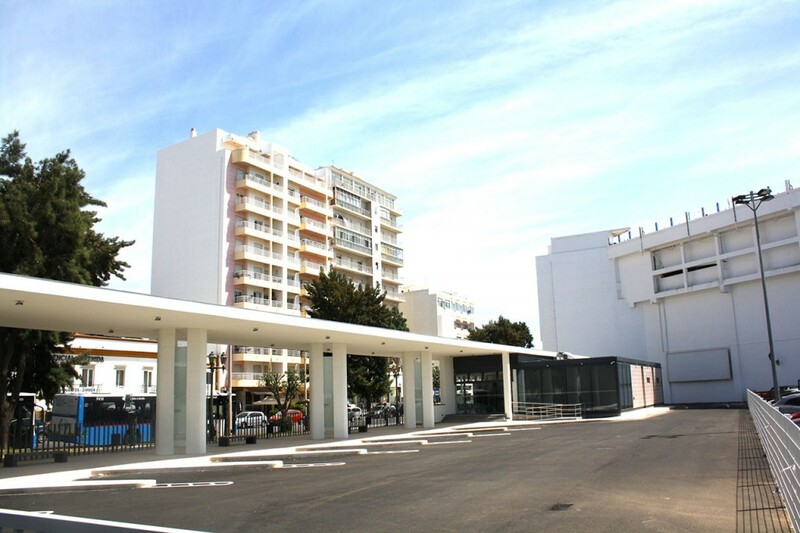 Right hand picture shows the main Faro Bus Station entrance - the building above is the Hotel EVA. An outdoor annex (to the right of this view) is used by the city's PROXIMO bus system. Picture here. This is about 150 metres from the railway station and very close to the city centre and marina. When boarding at the bus station, other than for PROXIMO local buses, you must buy your ticket from the ticket office inside the building. Be aware that timetables for buses to other towns are NOT displayed at ANY bus stops or inside the bus station. If you need a timetable, download it from this site, or the official website or obtain one at the bus station. Buses towards Loulé, also Quarteira, Vilamoura and Albufeira also stop outside the Forum Algarve Shopping Centre. Journey 40 minutes fare one-way €3.40. This bus stops a mile/1.6km from the Algarve Stadium near the Parque das Cidades railway station and also serves the Mar Shopping mall and IKEA store. This bus stops also stops in Faro at Tribunal, Radio Naval, Rotunda Hospital, Alto Rodes, Escola Alfonso III and Forum Algarve. LATE BUS : 2330 except Fridays,Saturdays and days before holidays, 0030 Fridays, Saturdays and days before holidays. In July and August the 2330 does not run, the 0030 runs every night. I do not know if that late bus will run on December 24th and 31st. Sundays and Holidays - first buses at 0615 (terminates at Mar Shopping) 0715, 0845, 1015, 1245 then at irregular intervals until 1930, 2115 then the very late bus as on weekdays. Saturdays except holidays at : 0730, 0930, 1100 then at irregular intervals until 2000 then at 2200. Sundays and Holidays : only at 0925, 1030, 1100, 1245, 1330, 1500, 1600, 1700, 1730, 1830, 2000 and 2200. Times at IKEA are 15 minutes after the time leaving Loulé. LATE BUS every night: 0015 except Fridays and Saturdays and not during July, August and December, 0115 on Friday night, Saturday night and nights before holidays, In July and August, the bus at 0015 does not run, the bus at 0115 runs every night. I do not know if that late bus will run on December 24th and 31st. Journey 15 - 25 minutes fare one-way €3.40. Most of these buses also stop in the centre of Faro, near the 'Tribunal'. Timetables have been removed from all bus stops! These are a mix of ‘Interurbanas’ which go to Olhaõ, then some continue to various places. There is also the ‘Rota da Ria Formosa’, which runs to Olhão then to Tavira and beyond. Sundays and holidays at : 0715, 0900, 1000, 1100, 1215, 1325, 1430, 1515, 1600, 1635, 1740, 1820, 1840, 1930 and 2035. NB – on WEEKDAYS (MFO) the 1235, 1310, 1735 and 1810 buses from Faro go direct from the bus station to Olhão and do not go through Faro city centre. Mondays to Fridays except holidays at : first bus at 0640, then about every 20 - 30 minutes until 1850 and then the last bus 1950 - full list of times here. Saturdays except holidays at : 0640, 0720, 0800, 0825, 0900, 0935, 1000, 1130, 1200, 1240, 1335, 1405, 1500, 1550, 1630, 1700, 1750, 1910 and 1950. Sundays and holidays at : 0640, 0825, 0900, 0935, 1100, 1240, 1335, 1405, 1500, 1550, 1630, 1700, 1750, 1910 and 1950. On WEEKDAYS (MFO) the 0840, 1340 and 1750 buses from Olhão do not go through Faro city centre but go direct to the bus station. Some buses on weekdays serve the Calvarinha, Bairro dos Pescadores and Patinha areas of Olhão, going round in a loop from the 'bus station´- for those times download the official timetable here. There are also regular trains about once every hour weekdays, slightly fewer at certain times on weekends and holidays between Faro and Olhão; one-way fare is €1.45, journey time 10 minutes. The Milreu Roman museum and site is closer to Estoi (X) than the village. Estoi (X) = the crossroads where the bus turns off the main road. FULL TIMETABLE – click here timetables have been removed from all bus stops in Faro! There are trains between Faro and Tavira at irregular intervals of between 1 - 2 hours. Trains are otherwise quicker, more frequent and cheaper than the bus - for times click here. To Alfandanga about once every hour on weekdays, less frequent at weekends and on holidays. To Moncarapacho four buses on weekdays, three on Saturdays but none on Sundays or holidays. FULL TIMETABLE – click here. Timetables have been removed from all bus stops. Six buses to/from Pechão, nine to/from Bela Curral on weekdays, no service at all on Saturdays, Sundays and Holidays. 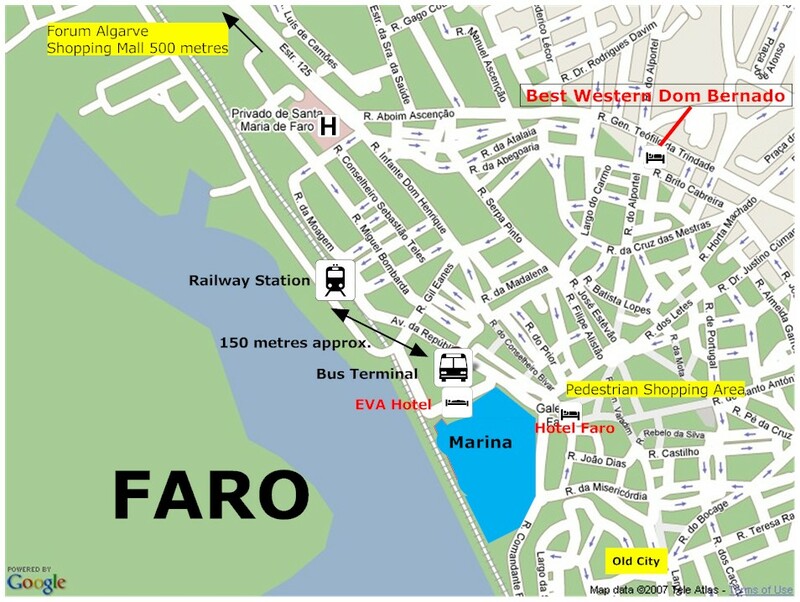 The buses below are the times for the local network, operated by EVA on behalf of Faro city council. For all timetables click here - external link. More information about buses at the Airport here. Maps and timetables are displayed at most stops. All Proximo buses have wifi so visitors need to be off-line even for 15 minutes! For map of routes click here - external link. Flat fare paid cash on board for these routes is €2,35. Discounted passes are available for frequent and regular travellers. Routes 14 and 16 run between the City Centre and Praia de Faro via the Airport. For maps and official timetables click here - external link. Buses start from the outdoor section of the bus station complex. Also in summer, a special route 17 runs around various areas of the city to and from the beach. Note the Praia de Faro bus stop is possibly unique, as it is on a bridge in the middle of the sea! The island is linked to the mainland by a narrow bridge; the bus cannot go any further than half way owing to a weight restriction, so you have to walk the last 150 metres or so to the island sands! All buses from or via the city centre stop at the outdoor section of the bus station complex. Cash fare for any journey is €2,35. Various discounted tickets and passes are available for regular users. Consult the official prices here - not available in English. Purchase passes at the bus station. 14 Atalia - city centre .- Forum Algarve shopping centre - Marchil - Montenegro - Airport - Praia de Faro. Three buses on weekdays, two each way on Saturdays and Sundays. Does not stop at the bus station. More buses run in July and August. 15 Gambelas (University) – Montenegro – Alto Rodes – Rotunda Hospital – Avenida (Terminal) Irregular service every 1 - 2 hours. Only a few buses run on Saturdays, Sundays and holidays. 16 Praia de Faro – Airport – Montenegro – Forum Algarve Shopping Centre - Avenida (Terminal) Daily service, one or two buses each hour all year 0500 - midnight. More details on this page. 17 São Luis - Penha - S. Luis - Rotunda Hospital - Alto Rodes - Gambelas - Praia de Faro (summer only, daily, about once an hour mornings and afternoons /early evenings, no buses around lunchtime) NB no longer goes via the airport, but stops at the roundabout (Rotunda) 3 minutes walk from the terminal building. 18 Gambelas (University) – Penha (University) – Avenida (Terminal) runs every half hour during the day on weekdays during University terms, once each hour in the evenings with last buses around 2300hrs, very irregular and infrequent otherwise. 19 Gambelas (University) - Marchil - Forum Algarve shopping centre - city centre - Avenida (Terminal) daily service at irregular times. 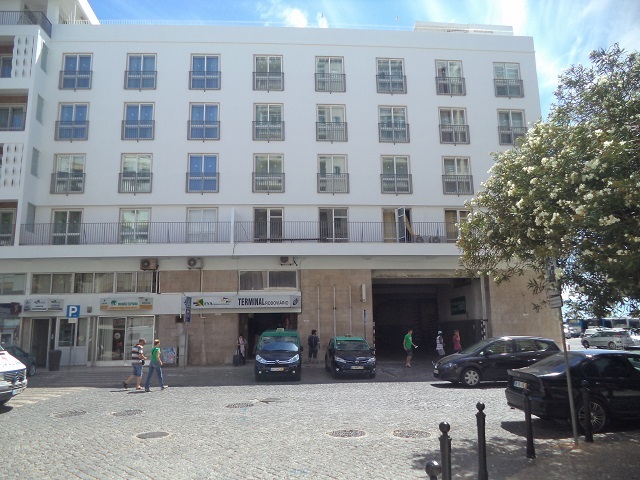 20 Bus Station - Forum Algarve - Hospital Particular - Gambelas (University) - Penha (University) - Liceu (Senior School) about once an hour, weekdays only. A supplementary network of minibus routes circulates from the bus station to various suburbs, including the University campus at Penha. Buses run every 15 minutes from approximately 0700 to 2000hrs on weekdays, then every 30 minutes until about 2200hrs. Different routes on Saturdays, numbers 6 to 9, every 30 minutes from 0800 to 1400 only. There is NO service on Saturday afternoons, Sundays or most Holidays. The weekend timetables cannot be found on the website! Timetables are displayed at most bus stops. For map and timetables please go to the official website here - external link. Cash fare one zone is €1.15, two zones €1.76 (!). Various discounted pre-pay passes are available, including a day ticket within zone 1 (City centre) costing €5,30. In summer, there are passenger ferries from Faro to Praia de Faro (island), Ilha Farol (the lighthouse island) and Culatra. 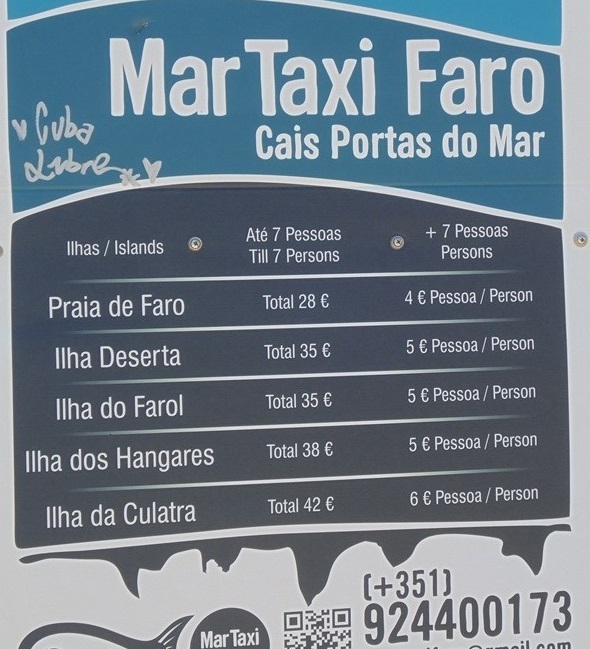 In summary, services are these : To Ilha da Farol six journeys every day until 31st August, then five daily until 16th September than four daily until end of summer service on 30th September. Journey time about 40 minutes. To Culatra, daily during July and August only, at 0830 and 1445, returning at 0935 and 1730. Journey about 50 minutes. To Praia de Faro (Faro beach) seven journeys each way every day until 31st August, six each day from 1st to 16th September, then four each way until end of service on Sunday 30th September. Journey about 30 minutes. Timetables in full and fares will be here for summer 2019. Departures are from Portas do Mar, a short walk from railway and bus stations beyond Faro marina and past the fire station, beside the old city wall. Map here. Parking is available at the Largo São Francisco, Avenida Eng. Joachim Belchior and elsewhere in the city. In winter there are no scheduled ferries from Faro to the outlying islands – these leave from Olhão. There are water taxis available all year - details here. These leave from Portas do Mar, as above. There are however cruises to the nature reserve and the Ilha Deserta daily all year. Some details here - external link that will open in a new window. The same company also offers a ‘water-taxi’ service to and from the islands. You will see the various posters etc of other companies at the marina. There is no scheduled bus service to the stadium (5 miles/8km from Faro) and special service is not often provided for events - for more information about access to the stadium please click here. There is a small railway station called Parque das Cidades about 3/4 mile (1km) from the stadium. However, there are very few trains and none at night.